One of the most important skills to master in sound recording is how you mount lavalier microphones on your subject. You need to take into account positioning, clothing noise, cable noise and tension and be a master of understanding materials, not to mention being able to mount the microphone effectively and comfortably on a subject in a matter of seconds. The video is recorded with a DPA 4060 lav mic attached to Poul’s chest using the Invisible Lav Covers FUR OUTDOOR. To make your life easier, Bubblebee Industries has released their new Invisible Lav Covers FUR OUTDOOR. 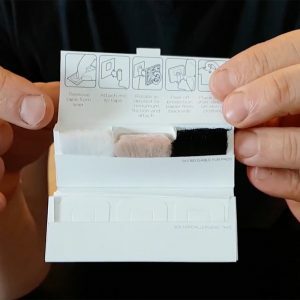 you may already be familiar with the Invisible Lav Covers, well the FOR OUTDOOR version couples Bubblebee’s Invisible Lav Tape with pre-cut squares of their unique Fur, packaged in a handy dispenser box. With 9 pieces of fur: 3 white, 3 beige and 3 black pieces of fur, the Bubblebee Invisible Lav Covers FUR OUTDOOR are incredibly good at protecting against wind and also very good at protecting your lav mic against rustling noise. In the video below, Poul from Bubblebee Industries shows you how to use these ingenious Lav Covers to mount lavalier microphones in the best positions for a variety of situations, and how to capture a better recording all round.